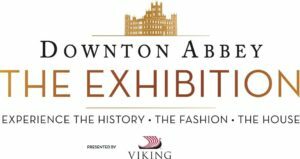 Downton Days are here again on PBS. A brand new year with a brand new glorious commercial free season of Downton, just the way we like it. 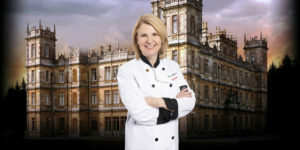 I was particularly thrilled that the great chefs at PBS didn’t mess with the UK version or feed us extra portions; in past years they would edit the shows and serve E1 and E2 together, which is ever so delicious, but makes the season so much shorter. Season 5 promises to be a great season, full of secrets and love in the most unexpected places. Lord D particularly enjoyed the Manners of Downton Abbey special which followed Episode 1. Over the past few weeks, many fans approached me for food pairing ideas to celebrate the launch of Season 5. 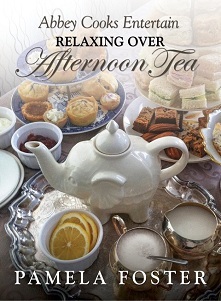 My Online Guide to Hosting a Downton Abbey Party has plenty of ideas. When pressed for a specific dish for this episode, I suggested a flambé (but not disclosing Edith’s bedroom fire), since any time you set fire to food, it is a special occasion. 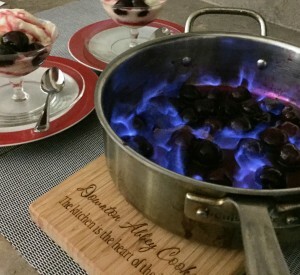 I chose Cherries Jubilee for its simplicity, grand effect, and the connection of its creator, Auguste Escoffier, to Downton Abbey. Season 5 of Downton Abbey has finally arrived in North America, broadcast on PBS, Sunday nights at 9 PM. Some appetizing articles to whet your appetite. 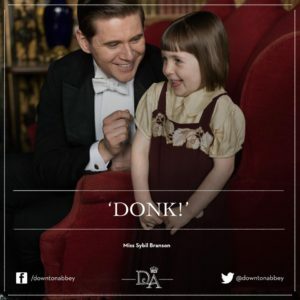 Downton Catchup: plot lines and history in one source. It’s Birthday Month for Maggie. Maggie Smith turned 80 this month. The Manners of Downton Abbey: did you see the special which followed S5E1? Sue Johnston joins the Cast in Season 5: if you liked her on Corrie, you will love her on Downton. Yahoo TV: Cast hint at what’s to come in Season 5 on their recent press junket. The S5 Christmas Episode (spoiler): was lovely…particularily since no one died. 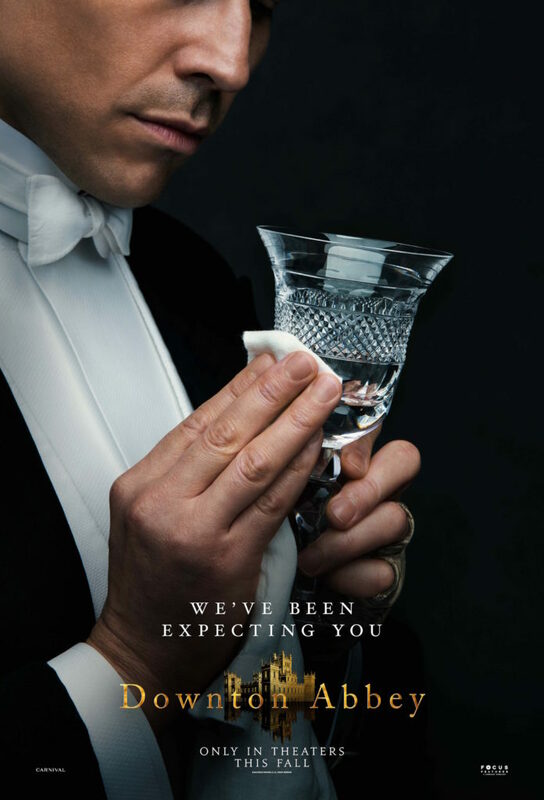 Will there be a Downton movie? Definite Possibility. How would you fare as an Edwardian? A Survival Guide. The Road to Downton. 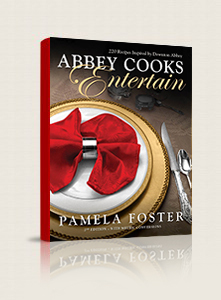 One woman’s journey to the Christmas Gala at Highclere. 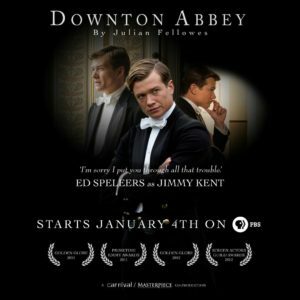 While I love watching Downton on PBS without commercial interruption, I really enjoyed the controversial Amazon Downton commercials on ITV; I am back to my dream of appearing as an extra on the show. I may settle for a tour of Highclere in the new year. Stay tuned. One secret is revealed. Baxter steals Thomas’ thunder by telling Cora about the theft. But is there more to the story? Moseley seems to think so. Poor Edith pines for her child and lost love, and in the process nearly burns the house down, giving Thomas the perfect opportunity to save his hide once again. Jimmy’s past catches up with him and is caught in a compromising position when the house goes up in flames. Good bye boy toy. Lord Merton is in hot pursuit of Isobel, which does not sit well with Violet. 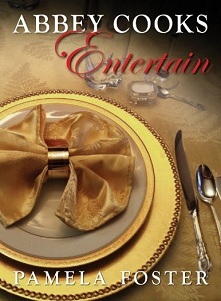 Sarah Bunting is invited to dinner as Tom’s friend but does not turn out to be Lord Granthan’s idea of a good guest. Daisy grows up a little more. She takes Ivy’s departure in stride and decides to better herself. She sends away for Math for Dummies, but doesn’t seem to help. Stay tuned. She is smarter than she thinks. You might think that Cherries Jubilee date back to the 60s when waiters would entertain diners with flaming cherries at your (parent’s) table. But the delightful dish dates back to the 1800s. The dish was created Chef Auguste Escoffier in honor of Queen Victoria’s Jubilee celebration. Alfred was accepted into Escoffier’s prestigious cooking school last season. Cherries was Queen Victoria’s favorite fruit so it was a good choice for dessert. The original version was not served over ice cream, but it is really far too sweet on its own. It is very simple to make and a crowd pleaser. Just make sure you serve it immediately. To help keep the ice cream from melting too quickly: scoop ice cream into 4 decorative dishes and keep in the freezer in advance. Wash and pit the cherries*. Place the cherries and sugar in a large skillet. Peel 2 large strips of zest from the lemon, add to the skillet, and then squeeze the lemon into the the skillet. Cover the skillet and cook over medium heat for 5 minutes until the sugar dissolves. Remove the cover and raise the heat and cook for another five minutes to release the juices from the cherries. To flambe, heat the Kirsch in a small pot on the stove. It will only take a couple of minutes. Ignite with a long match and carefully pour over the cherries, swirling until the flames subside. Bring our the serving dishes and spoon the cherries and syrup over top the ice cream. Serve immediately as the ice cream will melt. *Don’t have a Cherry Pitter? Before the creation of the cherry pitter, there were other ways to pit cherries which still work. Twist: the idea is to dig into the cherry and pull the pit out. Use a toothpick, un-bent paper clip into the stem-end of the cherry. You should feel it hit the pit. Twist around the pit and pop it out. It will take you a few cherries to get the feel of it. Poke: this method, like the cherry pitter, pushes the pit through the other side of the cherry. Place the cherry, stem side down on top of an empty glass soda bottle. Use a chopstick to force the pit through into the bottle.